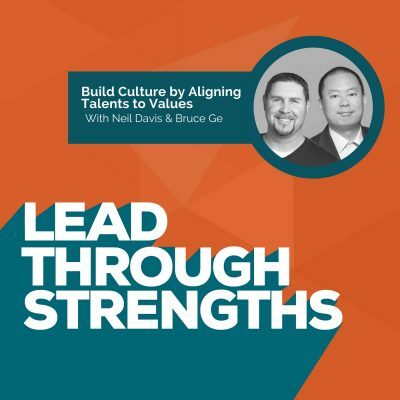 This week Lisa speaks with Bruce Ge and Neil Davis, who join us to talk about what it’s like to create an amazing culture at your company. They both give specific examples of ideas you can implement. Bruce Ge, the Chairman at Talro0 (formerly named Jobs2Careers), gives insight into the most important functions of executives. 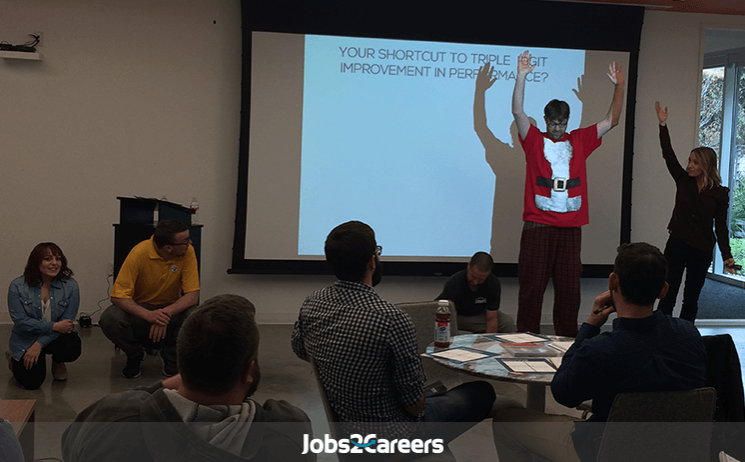 Neil Davis, the Director of HR, offers ways to integrate company culture into the hiring process. Unlike our usual audio-only interviews, this one was onsite at the Jobs2Careers headquarters in Austin, Texas. If you prefer to watch the full video versions of the interview, they are embedded below. If you go to their homepage for job seekers you’ll see roles in tons of industries, locations, and companies. 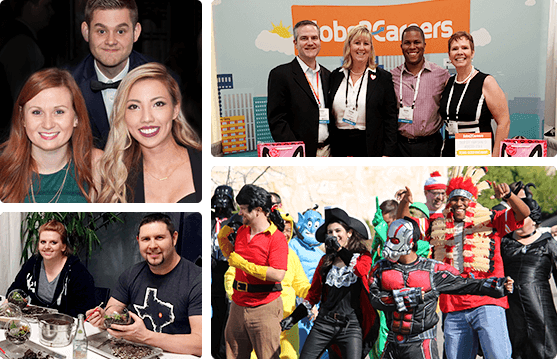 Check out their careers page to explore their open positions in Austin, TX. Keep in mind, even though they’re a software company, their workforce is onsite in Central Texas. Working together in the same location is actually part of their secret-culture-sauce. Finally, if you’re a hiring manager, you might be interested in the J2C For Employers page to check out their unique Pay Per Application model. Here’s the live interview with Bruce and Neil on camera. Lisa Cummings: [00:00:09] You’re listening to Lead Through Strengths, where you’ll learn to apply your greatest strengths, at work. I’m your host, Lisa Cummings, and I gotta tell you, whether you’re leading a team or leading yourself, it’s hard to find something more energizing and productive than using your natural talents every day at work. [00:00:28] And today you’ll get one of several episodes I’ve recorded that gives you specific examples straight from leaders who have built awesome company cultures, and there are so many direct ties between strengths and employee engagement on your team. So this peek behind the curtain at workplace culture will be a neat way to inspire ideas you can use at your company. 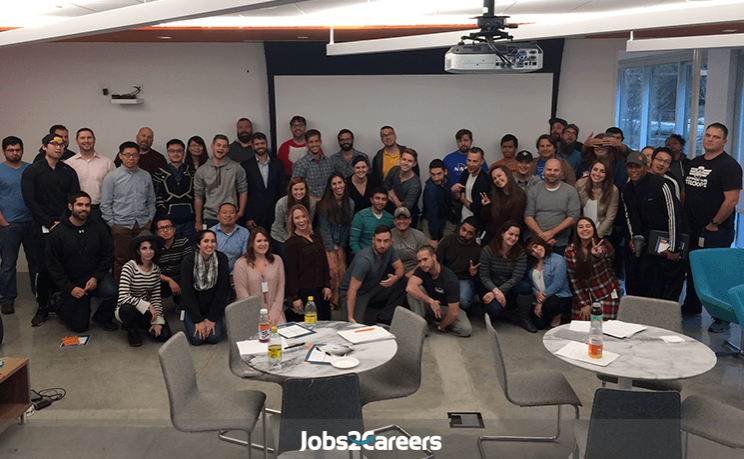 [00:00:51] Most of today’s episode was recorded on site at a company in Austin, Texas, called Jobs2Careers, which you’ll hear us refer to as J2C. of course, we’ll link to them in the show notes so that you can check them out all the way. [00:01:05] Now, this show features Neil Davis, their head of HR, and Bruce Ge, their CEO, who also joins us in the second half. In this episode, you’ll hear specific strategies that you can put your own spin on. One of my favorites is an example of how they live out their company values. So one of their top values is providing phenomenal experiences. [00:01:32] So one way they live this out is by literally rolling out the red carpet to welcome new hires and make them feel like superstars. Can you imagine how that would make you feel as a new teammate? Wow, I love that one, and there are several nuggets like that as you listen through. [00:01:50] If you would like to see the full impact of this interview with video, you can watch the interview portion of the show on the show notes page at LeadThroughStrengths.com/listen. And one note for this episode is that you’ll hear the tone of the audio change a bit as we move over to the on-site recording because we’re not in a regular studio environment. [00:02:13] So, with that, let’s jump over to the interview where I start with Neil, asking him, from the HR perspective, to tell us about their hiring process and how they use that to build their company culture.Neil Davis: [00:02:28] Our selection process, as you may have guessed already, is very different. We look for more than just technical skill or functional capacity; we look for how someone will be able to interact and work on a team on a daily basis. So we look for those interpersonal traits and skills like teamwork, communication, collaboration, and how people generally interact with people on the team. That has equal weight to the technical skill.Lisa Cummings: [00:02:56] Hmm, I love it. So I’m always talking about, anybody who’s a regular listener knows that I talk about the “what” and “how” all the time. So the “what” being the knowledge and the skills and the experiences, and the “how” being all the stuff that you just talked about. Now, how do you do it? Because you have to figure out really quickly how this is going to show up. How do you even get to that?Neil Davis: [00:03:17] It literally starts from the very first interaction with the candidate. We look at how they communicate with us, how they respond, even, sometimes, how quickly they respond, because it gives you an indicator of how they might be able to interact with folks, or communicate with folks, if they came on board here. [00:03:35] And then, when they come in face-to-face for an on-campus interview, we get feedback from every point of contact that that candidate had while they were there, and we take that feedback, we combine it with what we learned of their technical skill. If they’re a cultural fit and they have the technical aptitude, then they’re a great candidate for us to consider moving forward. [00:03:54] I, myself, take each candidate through a pretty extensive and, I’ve been told, pretty fun and unique value alignment assessment where we really assess situational attitude, reactionary communication, behavioral traits, and skills that are really important to preserving our culture here. Lisa Cummings: [00:04:12] I just want to talk about behavioral interviews for one second. I would give people the shortcut of, “Tell me about a time when this…” when you get them to give you examples. How would you shortcut what behavioral interviewing is? Neil Davis: [00:04:23] Very similar to that. We want to know how someone has demonstrated these skills or how their interpersonal traits manifest themselves in the workplace. So we ask about recent situations that they’ve gone through, and some of the questions are very unique, some of them are dead on straight to the point, and they all are very strategic in their format, and that’s to help us gain a better idea of the candidate. One of the ancillary benefits is the candidate gets to know a lot more about our culture and our value system by going through this process with us. Lisa Cummings: [00:04:54] So let’s talk values. Okay, when I first met you guys and we did a little bit of Strengths work, you told me that one of the ways you bring these things alive is every person – get this if you’re listening – every person gets asked the same question every day for one month. So ours would’ve been, “How did you use your Strengths yesterday, or today on the job?” Something to that effect? Neil Davis: [00:05:18] Something to that effect, right. Every time we have management training or professional development classes or training courses, all staff are invited not just people managers. And at the end of the training we institute a post-training question related to the concepts or the techniques that were taught in that course, and we add those to our daily status report, or our weekly status report templates, that managers actually give to each of their staff, the manager gets to direct feedback and it stays in that status report template for about a month, depending on when the next training class is. [00:05:53] The reason we do that is because: a) we know it takes longer than just a day or two for a concept to transform itself into a habit; b) we know that as that employee is focused on this post-training question every day or every week, you could see how their answers go from short to targeted and specific, and that’s when we know it works because it’s now a newly-developed habit, and then, of course, it supports one of our core company values. Lisa Cummings: [00:06:20] And we’re onto values, right. Neil Davis: [00:06:21] And that is the crux of why we do this. It’s “always grow” is the core value that it directly supports. We believe, whether it’s at an individual contributor level or as an organization, one of our core values has been, and will continue to be, to always grow. Push our boundaries, encourage ourselves to learn, make mistakes, learn from those mistakes and become better. Lisa Cummings: [00:06:45] And it’s such a practical tip for anybody listening, that you can just take a deep question like that, ask it every day, and you start to see the depth. What are the other values at Jobs2Careers? Neil Davis: [00:06:57] Sure. We have five company values, and they truly all start with “do the right thing.” That, of course, reflects on the integrity piece. And then, of course, creating phenomenal experiences not just for our clients and our partners but also for our internal customers and teammates. That starts truly with new hires on board day one. We roll out this long orange carpet, they’re literally walking across this carpet, we have their favorite drink in hand waiting for them. Lisa Cummings: [00:07:27] And how do you know their favorite drink? Neil Davis: [00:07:29] We ask that in the interview process, and it’s shocking to see their response when they realize we’ve paid attention and they forgot that they’ve told us what their favorite drink was, and then we had it for them on their first day. So that’s a way that we create phenomenal experiences even for our new hires. And, of course, I mentioned “always grow” and how that is one of our core company values. [00:07:50] We also go the extra mile. Go the extra mile is important for us because it is truly a part of teamwork, which is our fifth core company value. So those are our five core company values, and we live them every day. Lisa Cummings: [00:08:04] Yeah, I really see people living them out. And for anybody who’s listening and thought, “Orange carpet?” If you haven’t seen the video on Jobs2Careers, or you haven’t looked at their website, it’s one of their two company colors. It’s the primary color, right? Neil Davis: [00:08:19] Correct. Orange and teal blue. Right. Lisa Cummings: [00:08:22] Right. And then, something I thought was cool that, as I got to know the team, I kept hearing more and more examples of small things that might represent a phenomenal experience that someone else would need. So someone in the customer-facing customer service kind of team said something about how when they saw that their energy was waning, and they needed a little boost on the phone, they would do planks together as a team and it’s one of those ways to support teamwork. Neil Davis: [00:09:02] Absolutely. Another way we do that, and it might seem small but it really is impactful, we have created values cards. And on these values cards it list each of our five core values individually, but it also list a section where you can fill in what this employee did, and who it’s from, and you check what value you saw them represent, or you saw them personified, and you give them that values card as a way to individually recognize their effort, and also a way to inspire them to continue living our values. Neil Davis: [00:09:38] Right. Right. It’s a point of pride here for sure. Lisa Cummings: [00:09:41] Well, Neil, thank you for giving us a peek of what it’s like here. Neil Davis: [00:09:45] Thank you for talking to me. Appreciate it. Lisa Cummings: [00:09:47] It was a good time. [00:09:50] So, are you filled up with ideas yet? I know I am. My favorite top five from Neil were: one, rolling out the red or orange carpet for new hires; two, surprising a new hire by greeting them with their favorite drink; three, having pre-printed values cards to make it easy to give recognition to each other; four, doing planks together as a team as a quick energizer; and, five, deepening the application of a training class by asking a question from that month’s training in their daily status report documents. [00:10:22] This one, after getting inspired by J2C’s follow-up questions to our Strengths training with their company, my team decided to experiment with this as well, and we started with the question, “How did you use your Strengths at work today?” It was really interesting to me to see the difference in responses. I got everything from detailed and thoughtful answers, all the way through a rushed, “I used my Learner talent today.”[00:10:48] So play around with it to complement your work styles. And the biggest learning for me was to properly introduce the question and what’s behind it rather than just writing it and not explaining because when I did that the answers were way more generic. [00:11:04] So, okay, in the next section of the on-site interview you get to learn from Bruce Ge, the CEO of Jobs2Careers. I thought you’d enjoy hearing about leadership from a founder perspective as well. [00:11:17] Now, he has led this company through extreme growth and he gives you a viewpoint on the most important functions of executives. And some of his opinions might even surprise you, like the fact that he offers management training to every employee, regardless of their current role, because he wants to prepare each person for leadership positions, even if that means they need to leave the company to live into their potential. [00:11:44] So here’s my interview with Bruce where we pick up a conversation about their company value called “always grow,” and how one way they execute it is this monthly training.Bruce Ge: [00:11:58] Oftentimes we’ll ask employees, “What is your ambition?” They would say, “I want to become a manager. I want to become an executive.” And a lot of them are never presented an opportunity. They don’t even know what are the expectations from them, and how they’re judged. So, in order to be fair, I want to provide an opportunity at least for them to know what a high-level manager should be like. [00:12:24] So the main point is to grow the employees, which is adding value to what Jobs2Careers can provide to their career growth. I also get a side benefit of getting jobs done more efficiently. Ultimately, the education I give to the employees will go with the employees. Well, to be honest, I don’t need all of my people to become managers. But that’s fine, I will be proud if one day my employees become managers or executives of other companies. [00:12:53] So I set a high bar for most of my people and I push them to grow. Eventually, a lot of them will make to the management or executive level in other companies, I’ll be proud of it. So the point is, I’m trying to make a good deal with my employees.Lisa Cummings: [00:13:08] It’s a very mature way of looking at leadership. A lot of times people feel like they want to be talent hoarders.Bruce Ge: [00:13:14] I think you have a very good point. Trying to stop talent from growing is going to hurt both sides. Eventually, if I grow my people to a very high level, they will leave me because there are some opportunities outside of Jobs2Careers and I should be happy for them. It’s a win-win deal. Lisa Cummings: [00:13:32] It is win-win. One thing that I think of when I think of a company like yours is I have a lot of clients who are tech companies or they’re in the Bay Area or they’re fast-growth, and the founder has had a major impact on the culture. What are you doing? Because I can tell you’re doing something to ensure that there’s a culture that’s on purpose and it’s not just your personal personality. How are you doing this? Bruce Ge: [00:13:59] I think the most important value a CEO needs to keep in mind is integrity, especially accountability. Let me take an example of what we do differently from other companies. Jobs2Careers do not impose regular overtime. We require efficient eight hours work, but we do not expect people to work unless there’s an emergency or something really important. [00:14:21] So people can find a good balance of life and work. And this is very well-received because you do see companies who try to push people to work 10, 12 hours a day. I think it tarnishes the image of the employer. It makes your people trust your employer less. So that’s the things I’m trying to avoid. I want to behave with a high integrity, and I also hold other people accountable for high integrity. So those are the small things we do that make a difference. But it’s important that we hold ourselves, employers hold ourselves to a very high level of integrity, and that sets a very good example for the employees. Lisa Cummings: [00:15:01] I think modeling what you expect of people is critical. If you said one thing and then you didn’t hold yourself to it, it would not become part of the culture. Bruce Ge: [00:15:10] It damages credibility and everything will go south from there. Lisa Cummings: [00:15:16] I went back out and peeked at your LinkedIn profile again the other day, and I noticed that you mentioned how important recruiting is in your role as CEO, and I think that’s a rare thing to say, “As CEO, recruiting is one of my top job responsibilities,” and it certainly tells me a lot about why the culture here is what it is. Can you talk about what led you to make that one of your most important job responsibilities? Bruce Ge: [00:15:46] Acquiring and retaining talent is probably the most important function of my job. We have been very selective in who we will bring on board. Not only executives, also we have a very high bar for entry-level people. Why develop so much attention for me? Because one is very hard. It takes so much time to know people and it requires patience. [00:16:13] We have like less than 1% hiring rate from resumes to employees. It also requires a lot of people knowledge. We need good sense to identify the talent. So, ultimately, what matters to an organization is your people. That’s probably the most important element that requires me to invest my time on. Lisa Cummings: [00:16:35] It’s a key thing when I talk to listeners, when I talk to my clients, and their leaders are struggling. A lot of times it’s because they’re focusing on the work, but not the people doing the work, so you’re really onto something that is a differentiator I see in the marketplace also.Bruce Ge: [00:16:54] Thank you. Yes, I am very clear on what a CEO should focus on. I’m not focused on any detail-level work. I only focus on people. So once I have the talent, I put them in charge of product, sales, marketing, they handle everything. I need to make sure they’re happy, and I need to make sure they are doing the right management job. My job becomes easy and my organization becomes efficient at the same time.Lisa Cummings: [00:17:19] Gives you some time to play ping pong?Bruce Ge: [00:17:21] I have enough time to spend with my family. I golf every week, play ping pong sometimes. It’s a good life.Lisa Cummings: [00:17:30] Love it. Bruce Ge, thank you.Bruce Ge: [00:17:32] Thank you, Lisa. Lisa Cummings: [00:17:33:] We appreciate it. I know the listeners will love so much hearing all these angles, being able to see a marketing leader, a CEO, an HR person at such a fast-growing company with such a fun culture. [00:17:47] Boy, what a treat to hear from a leader who is growing a thriving company. All his team members are thriving too. [00:17:54] My top five ideas from Bruce were: one, offer leadership training to everyone because it’s a win for everyone; number two, model the behaviors you want to see because you can only be credible as a manager if you’re leading through the accountability and the integrity that you expect from everyone else; number three, the number one role of a leader is finding the right people for the team and developing them; number four, if you make a culture of accountability, you don’t have to create a culture of working 12 hour days, even at a software company; and number five – that’s my favorite one – and that is to never hoard talent, to help everyone grow even if that means some people have to leave the company to live into their highest potential. [00:18:43] And that, my friends, is a wrap. [00:18:46] Neil and Bruce, thank you for the backstage pass. What a cool set of ideas to get the outcomes of the work by focusing on the people doing the work. I feel like that’s such an important statement. They gave us such a cool set of ideas to get the outcomes of the work by focusing on the people doing the work. So big. And now you have at least 10 more inspirations you can use to ramp up your culture, so just pick one. Do one thing this week. [00:19:16] If you’re using our RAMP model to build your culture, remember R is to nurture relationships, A is to create an environment where people can experience regular accomplishment, M is for meaning and purpose, and P is for positive interactions. And this is in perfect alignment with building a strengths-based culture. [00:19:40] If you’re noticing what works at work, you’re going to get more of what works at work. So if you want to recognize people on your team, we made a resource for you. Go to LeadThroughStrengths.com/resources, and one of the documents there gives you 127 ways to offer recognition this week. And it really is possible to nurture all four of those areas of the RAMP model with one sincere recognition, so imagine what you can do if you put that on repeat. [00:20:13] Like we always say, by nurturing Strengths, you’re nurturing performance at work. If you’re putting a lopsided focus on fixing weaknesses, you’re choosing the path of most resistance. So claim your new work culture, and share the positive results with the world.